Welcome to Custom Garage Works! 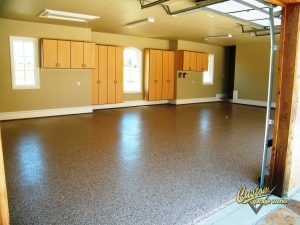 Known for our custom garage floor coating in Cedar Hill, TX, we first began our business in 2003. We decided to create the perfect garage for ourselves and our growing families, and when we couldn’t find what we were looking for within the current industry, we made the decision to jump in ourselves. Presently speaking, we are proud to provide our clients with some of the greatest garage storage solutions on the market, along with floor coatings that are tougher and more durable than traditional epoxy. We are dedicated to excellence, and we are passionate about providing premium garage floor coating and custom garage organization throughout the DFW area. Out of all of our services, our most common services is our polyurea polyaspartic floor coating in Cedar Hill, TX. This is because by using polyaspartic coatings instead of epoxy, we get a finish that lasts longer and is more durable. Thanks to it’s tough composition, our polyurea-based floor coating is resistant to changing color and failing that can occur with epoxy. In addition to our floor preparation, which includes professional diamond grinding, instead of acid etching, the end result is a showroom quality floor that is simple to clean, and practically indestructible. If you’d like to learn more about our reliable garage floor coating services, give us a call at 214-494-9068 or 817-308-1305 and schedule your free estimate! Garage Floor Grinding By using diamond grinding instead of acid etching, we can ensure a stronger, more resilient coating that will last for years. When you decide on a storage solution from Custom Garage Works, you won’t ever need to shuffle through piles of clutter in your garage again. The best custom garages have an organization system in place. With options such as garage cabinets and overhead storage racks, we have a variety of options for our clients’ garage organization requirements. We carry some of the most resilient overhead storage racks in the industry, and our storage cabinets are specifically made for garage needs. For a dependable garage floor coating in Cedar Hill, TX that will last for year after year, and an organization solution that can’t be beat, you can depend on Custom Garage Works! Overhead Storage Racks If you want to get the most out of your overhead storage space, our reliable storage racks are a fantastic place to start! 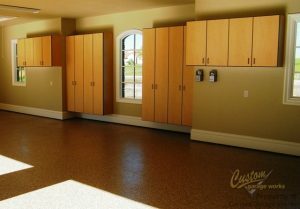 Storage Cabinets Our custom garage cabinets are precisely designed to be stronger, and to resist extreme temperatures. Car Lifts Are you running out of space for your vehicles? Our garage auto lifts can assist you!